1. Press the power button (№1) On. The light indicates that power is On. You can use this button to turn the power Off. 3-4. Press arrow up (№3) or down (№4) to set the selected temperature from 30°C (85°F) to 70°C (160°F). For extended periods (overnight), 35-40°C is suggested for lighter effects. For shorter sessions, 45-55°C is good to get full therapy or energy. For maximum sauna effect at about 30 minutes, 60-70°C is ideal. 5. The two digits on the left side of the red LED display (№5) show the actual temperature. Once you start pressing the arrow buttons up or down, they show your selected temperature for a few seconds, and then go back to showing the actual temperature. 6. Press the timer button (№6) then use the up and down arrow buttons to set auto shut-off for 1 to 9 hours. 7. The one digit on the right side of the red LED display (№7) shows the number of hours the timer is set to. 8. 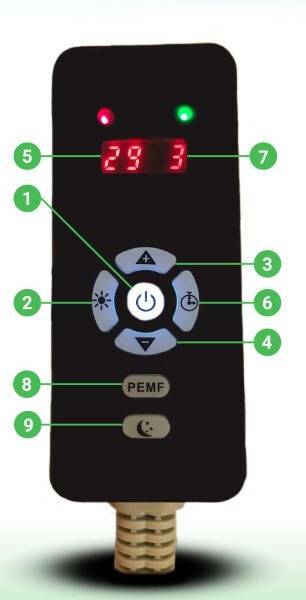 Press the PEMF button (№8) to turn PEMF On/Off. 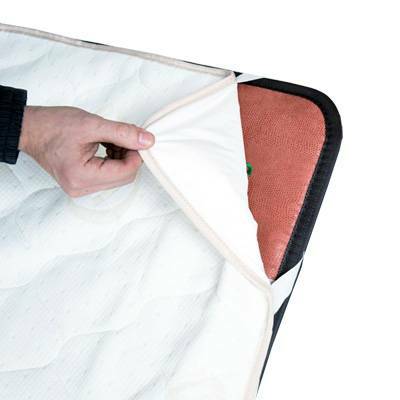 The PEMF function works independently with or without heat. The PEMF operates at a 20/100 minute cycle. After you press the button it is on for 20 minutes, then idles for 100 minutes, then again active for 20 minutes. This cycle continues for up to 12 hours or until you press PEMF button Off. To restart another 20 minutes without waiting you can press this button Off then On again. 9. The sleep mode button (№9) sets the mat temperature to 30°C (85°F). 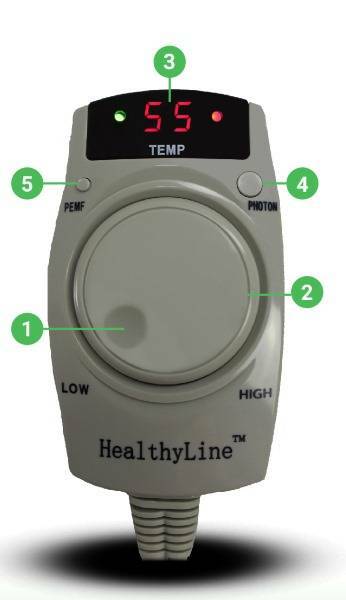 This allows you get some benefits of infrared and negative ions without feeling the heat. 1. Press the power button (№1) On. The green light indicates that the power is On. You can use this button to turn the power Off. 2. Press the timer button (№2) to choose between 3-hour (press once), 6-hour (press twice) or 12-hour (press three times) settings. The green light indicates which time setting is selected. 3. 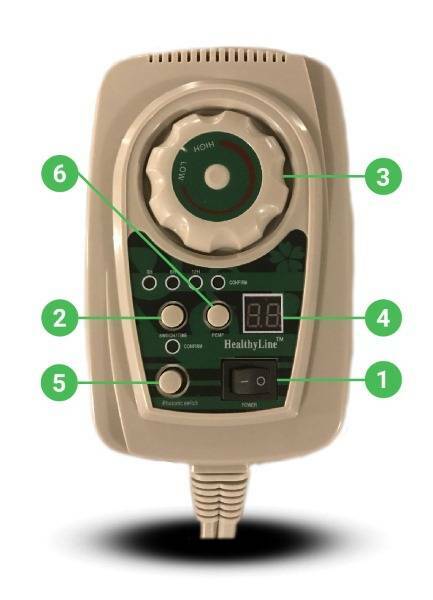 Turn the dial (№3) to set your selected temperature from 30°C (85°F) to 70°C (160°F). For extended periods (overnight), 35-40°C is suggested for lighter effects. For shorter sessions, 45-55°C is good to get full therapy or energy. For maximum sauna effect, for about 30 minutes, 60-70°C is ideal. 4. The red LED display (№4) shows the actual temperature. Once you start turning the dial it shows your selected temperature for a few seconds, and then goes back to showing the actual temperature. 5. Press the PEMF button (№5) to turn PEMF On/Off. 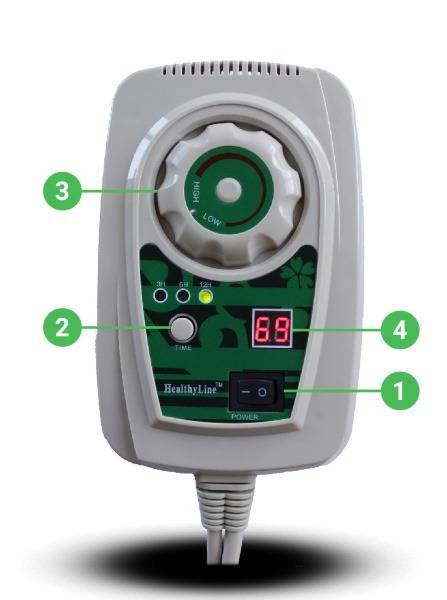 The PEMF function works independently with or without heat. The PEMF operates at a 20/100 cycle. After you press the button it is on for 20 minutes, then idles for 100 minutes, then again active for 20 minutes. This cycle continues for up to 12 hours or until you press PEMF button Off. To restart another 20 minutes without waiting you can press this button Off then On again. 1. Flip the power switch (№1) On. The display will start to show a red light. You can use this switch to turn the power Off. 5. Press the Photon button (№5) to turn the photon lights On/Off. The lights operate independent of the heat. 6. Press the PEMF button (№6) to turn PEMF On/Off. 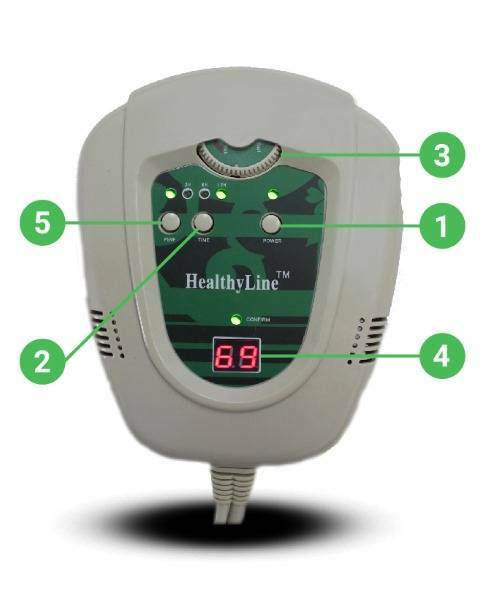 The PEMF function works independently with or without heat. The PEMF operates at a 20/100 cycle. After you press the button it is on for 20 minutes, then idles for 100 minutes, then again active for 20 minutes. This cycle continues for up to 12 hours or until you press PEMF button Off. To restart another 20 minutes without waiting you can press this button Off then On again. 2.Press the timer button (№2) to choose between 3-hour (press once), 6-hour (press twice) or 12-hour (press three times) settings. The green light indicates which time setting is selected. 4. The red LED display (№4) shows the actual temperature. Once you start turning the dial it shows your selected temperature for a few seconds, and then goes back to showing the actual temperature. Once the selected temperature is reached, the red display will start showing blinking lines instead of the temperature. 1. Turn the dial (№1) clockwise. Once you feel the click and the display lights up, the power is On. To turn the power off turn the dial counterclockwise until it clicks. 2. Continue turning the dial clockwise to increase the heat, or counterclockwise to decrease the heat (№2) . 3. The red LED display (№3) shows the actual temperature. Once you start turning the dial it shows your selected temperature for a few seconds, and then goes back to showing the actual temperature. 4. Press the Photon button (№4) to turn the photon lights On/Off. The lights operate independent of the heat. The controller is set to auto shut off after 12 hours. If you need to set your mat to automatically shut off earlier, you can use an external power timer. 1. Flip the power switch (№1) On. The light indicates that the power is On. You can use this switch to turn the power Off. 2. Turn the dial to set your selected temperature (№2) clockwise to increase the heat, or counterclockwise to decrease the heat. The controller is set to automatically shut off after 12 hours. 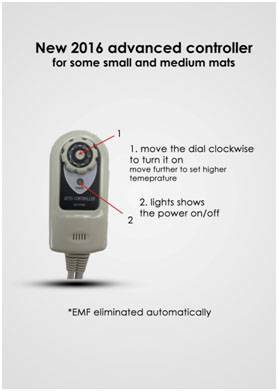 If you need to set your mat to automatically shut off earlier, you can use an external power timer. 2. Press the top temperature button (№2) to increase the temperature. 3. Press the bottom temperature button (№3) to decrease the temperature. – Using those buttons, you can set your selected temperature from 30°C (85°F) to 70°C (160°F). For extended periods (overnight), 35-40°C is suggested for lighter effects. For shorter sessions, 45-55°C is good to get full therapy or energy. For maximum sauna effect, for about 30 minutes, 60-70°C is ideal. 4. The two digits on the left side of the red LED display (№4) show the actual temperature. Once you start turning the dial they show your selected temperature for a few seconds, and then go back to showing the actual temperature. 5. 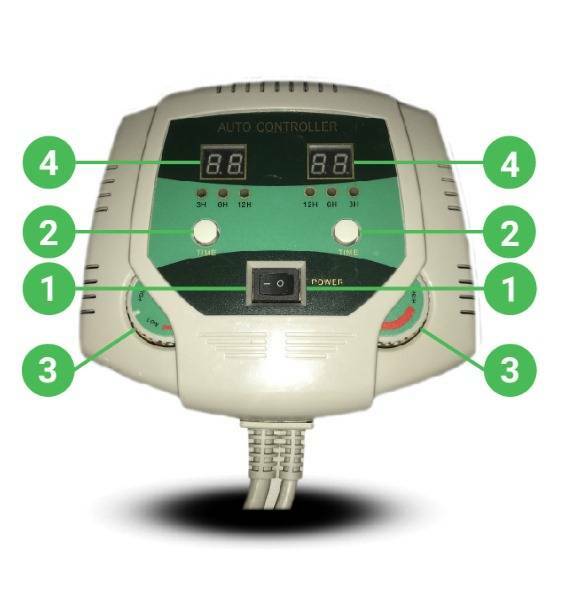 Press the top timer button (№5) to increase the auto shut-off timer up to 9 hours. 6. Press the bottom timer button (№6) to decrease the number of hours in the timer setting. 7. The one digit on the right side of the red LED display (№7) shows how many hours until the mat automatically shuts off. – “O” Turns off the timer and the mat will work for 12 straight hours. – “A” Turns the Photon Light function On/Off. The lights operate independent of the heat. – “P” – Turns the PEMF On/Off. 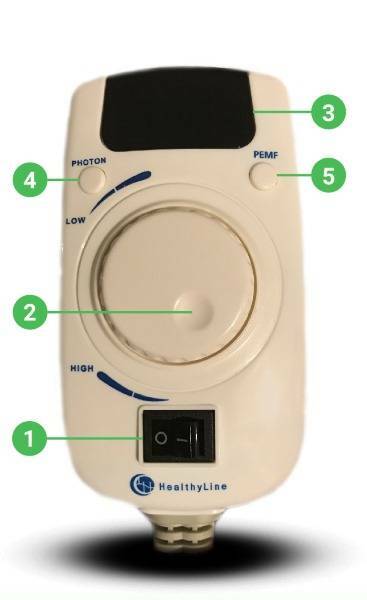 The PEMF function works independently with or without heat. The PEMF operates at a 20/100 cycle. After you press the button it is on for 20 minutes, then idles for 100 minutes, then again active for 20 minutes. This cycle continues for up to 12 hours or until you press PEMF button Off. To restart another 20 minutes without waiting you can press this button Off then On again. 9. The light in the middle (№9) shows if Photon or PEMF function is On. This mat and controller can only work with 12-volt power. Please do not try to use it at home with regular power. 1. To turn the power on, turn the dial (№1) clockwise until you feel the click and see the lights turn on. To set the temperature, continue to turn the dial clockwise to increase the heat, or counterclockwise to decrease the heat. The dial is marked with six lighted positions representing temperature from 20°C (70°F) to 50°C (125°F). 2. The light under the dial shows that the controller is On. We suggest using the “3” setting on the dial and move up if necessary. 2. Press the timer button (№2) to choose between 3-hour (press once), 6-hour (press twice) or 12-hour (press three times) settings. The green light next to it shows which time setting is selected. 3. Turn the dial (№3) to set your selected temperature from 30°C (85°F) to 70°C (160°F). For extended periods (overnight), 35-40°C is suggested for lighter effects. For shorter sessions, 45-55°C is good to receive full therapy or energy. For maximum sauna effect, for about 30 minutes, 60-70°C is ideal. 4. The red LED display (№4) shows the actual temperature. Once you start turning the dial it shows your selected temperature for a few seconds, and then goes back to showing the actual temperature. Once your selected temperature is reached, the red display will start showing blinking lines instead of the temperature.